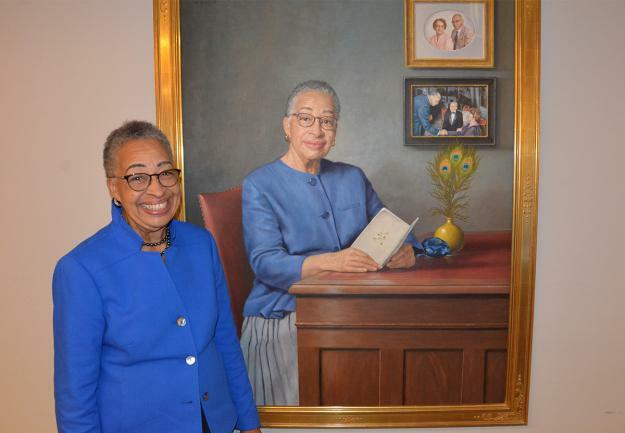 Former Dean Joy Phinizy Williams poses in front of her portrait, painted by James Crowley and sponsored by the Office of the Dean of Medical Education, on October 25 during a dedication and unveiling ceremony at Georgetown University School of Medicine (GUSOM). (November 2, 2018) — The Proctor Harvey Amphitheater was packed on the evening of October 25 as students, faculty and staff gathered for the dedication and unveiling of the portrait of former Dean Joy Phinizy Williams. Painted by nationally recognized portrait artist James Crowley, the new portrait was sponsored by the Office of the Dean of Medical Education at Georgetown University School of Medicine (GUSOM). Georgetown Women in Medicine (GWIM) sponsored the evening reception. 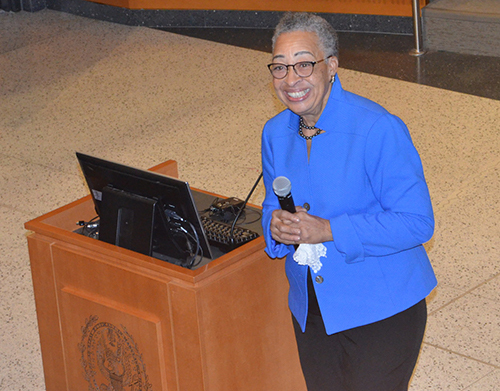 Stephen Ray Mitchell, MD, MBA, dean for medical education, kicked off the ceremony by honoring Williams and her contributions to Georgetown through her 35 years of service. “Dean Williams, we love you. We’re so proud of what you’ve given to us over the decades. We will try our best to live up to you,” he stated. As the former senior associate dean for students and special programs at GUSOM, Williams is best known as “co-creator, heart and soul” of the Georgetown Experimental Medical Studies (GEMS) program. She began her tenure at Georgetown in 1979, and served as assistant director in the office of minority student development before becoming assistant dean for students and special programs. She served in that role and as GEMS program director until her retirement in 2014. Williams was known as a pillar of wisdom and support at GUSOM. David Taylor, M.Ed, senior associate dean for student learning and academic advising, spoke about the “moments of wisdom” that Dean Williams would often impart on students. 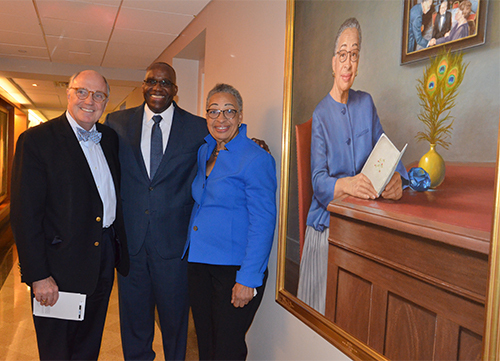 David Taylor, M.Ed, senior associate dean for student learning and academic advising, and Stephen Ray Mitchell, MD, MBA, dean for medical education, stand with Dean Williams and her portrait. One of those moments can be encapsulated in the phrase “Think about that,” which was Williams’ way of encouraging students to reflect. “Dean Williams is reminding you in that moment to ‘think about that’ because you need to consider the perspective of others. ‘Think about that’ because it’s a moment of growth for you. That’s a wisdom moment,” said Taylor. The other moment, shared on behalf of Tamika Auguste, MD (M’00) and graduate of the GEMS program, centered on Williams’ ability to know when students needed an ear. “Dean Williams will listen, you will share, but you don’t just talk about academics and things related to school — you talk about life,” reflected Taylor. Taylor tied both back to the portrait, sharing that when students, faculty and staff walk by, they will see Williams reminding them to reflect. Dean Williams gives her remarks and thanks the GUSOM community for honoring her legacy. However, she also detailed her conversations with the artist, and how she believes it was those conversations that made a difference in the final piece. Taylor echoed Williams’ comment by sharing his experience upon first seeing the portrait. Williams will be joined on the walls next spring by the late Estelle Ramey, PhD, emeritus professor of physiology and biophysics at Georgetown. Her portrait was commissioned by GWIM as as part of its “Women on the Walls” campaign, which aims to increase the visibility of women leaders at the medical center.